Knowing the boys and even Alana have been long time fans of Littlest Pet Shop, I quickly agreed to review the newest in the DVD series. 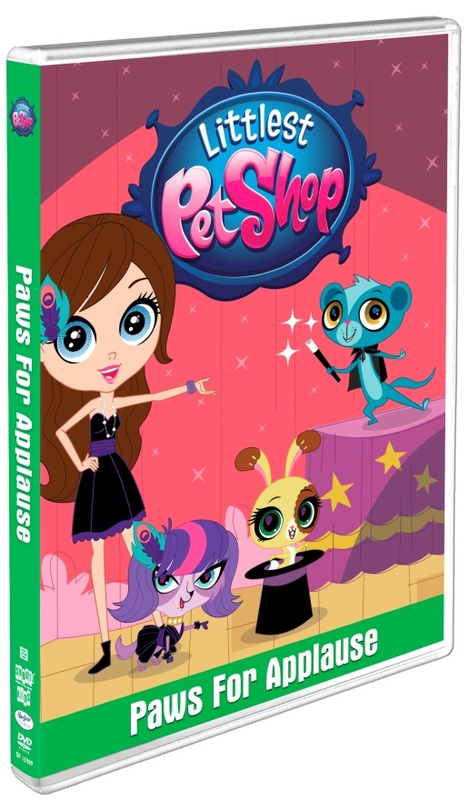 On June 16th, 2015, Shout Factory Kids, in collaboration with Hasbro Studios, released Littlest Pet Shop: Paws for Applause on DVD! This collection will include 5 episodes featuring Blythe Baxter (Ashleigh Ball). Also included is a bonus sing-along. Since we first watched the cartoon years ago, both boys have since become huge fans of the show! They both seem very content watching this one just like any of the others. They both mentioned that the first episode on the DVD was the best and worst because Blythe leaves and all the pets miss her quite a bit while at fashion camp! They said it made them sad to watch them continuously miss each other but they were happy when they finally met up! Recommendation: Both boys enjoyed watching this and I thought the lessons especially about dealing with separation were fantastic! I definitely think it's worth it to purchase any of these DVD's if you've got little ones. There were tons of colors and good lessons all which kept Declan's interest viewing it more than once. Giveaway: Shout Factory is going to give one of A Lucky Ladybug's lucky readers a copy of Littlest Pet Shop: Paws for Applause on DVD to have of their own! No plans for the summer yet. My kids both do swim team in the summer. We are still formulating our plans for the summer. My daughter is going to summer camp leaving this Sunday. She is super excited. We don't really have any official Summer plans or trips planned. We are mostly just going to swim and relax. My daughter will not be in any camps. We have plans for short days camps. We'll be busy with sports and camping too. My daughter and I are going to NYC to visit my sister! We are so excited! Our plans for the summer are babysitting our granddaughter, we plan to spend a lot of days at the playground and down at the river. daycare during the week at a new summer camp. pool, pond, fishing, boating. they love it! and on the weekends, we'll do some family camping in the woods of NH. I've already taken my backpacking trip. Now, I am fishing and crabbing. My 6 month old grandbaby will be taking swim classes this summer. No camp or anything like that for the kids, they're too young. We have plans to go back to the water park soon. My nieces and nephews have been here since school was out. 3 of the girls left for camp but I still have 2 more here. They have been doing everything this summer. She's too young for camps now but we will be hanging out in town. We do not have any plans for the summer right now. We are debating a local theme park but no solid plans yet. My plans are to go downtown Chicago to the beaches and do some swimming. I believe that you are doing fine with your blog the way it is now. I just gave birth to two little on June 4th. We don't have any big plans yet, but we are going on our first family outing to the local farmer's market this weekend.